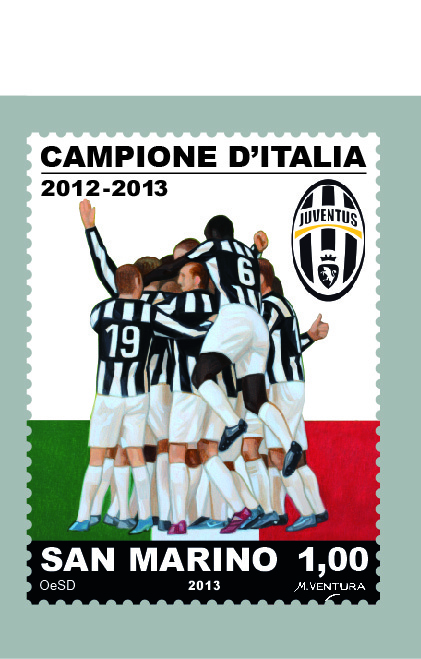 AASFN celebrates the Juventus Football Club winner team of the Italian Soccer Championship 2012 – 2013 with a philatelic issue. The stamp depicts the exultance of the players of the team led by Antonio Conte: among them you can recognize Paul Pobga, Leonardo Bonucci and Giorgio Chiellini. The set designed by Marco Ventura shows also the official shield of the team on the right. The selvedges of the sheet are in black and white. In the descriptive strip there is the writing “Juventus Italian Champion 2012-2013”, two shields (one of Italy and one of the winner team) and below four stylized players.